Over the past nine years, Punch Brothers have helped popularize “prog-grass”—a forward-thinking movement that utilizes traditional bluegrass instrumentation while weaving in elements of classical, alternative rock, jazz and even mainstream pop. Essentially, the quintet (Thile, violinist Gabe Witcher, banjoist Noam Pikelny, guitarist Chris Eldridge, bassist Paul Kowert) are modernizing the bluegrass format for the 21st century. The Phosphorescent Blues adds emotional resonance to that approach, underpinning the band’s tasteful virtuoso playing with a lyrical concept about artificial connection—namely, our culture’s addiction to smartphones. Just like “Movement and Location,” the heroic opener from 2012’s Who’s Feeling Young Now?, “Familiarity” is the album’s musical and intellectual centerpiece—both exhilarating and exhausting in its sprawl. Elsewhere, The Phosphorescent Blues explores the same weighty themes while recoiling the density. “Julep” finds a dead narrator reflecting back on his life via the Great Unknown, the band conjuring an ethereal mood through Kowert’s spongy bass, Witcher’s sustained string lines and Pikelny’s banjo harmonics. Lead single “I Blew It Off” filters technological dread into their clearest pop moment to date. It’s a master-class of tension and release—building from simmering chamber-country to a massive, cathartic chorus. Working with producer T Bone Burnett, the quintet add occasional tweaks (electric guitar cameos, a borderline electronic kick drum pulse on the bluesy “Magnet”) into their well-honed sound, subtly brightening their sonic palette. As usual, the band is mixed evenly across the stereo spectrum—each player occupying a real physical space, replicating the intimacy of their dynamic stage show. There’s a casual warmth and charm to the way these instruments intertwine: During the reflective coda of “Familiarity,” each player enters the arrangement so naturally, you can feel them walking into a sunny rehearsal space after taking sips of coffee. 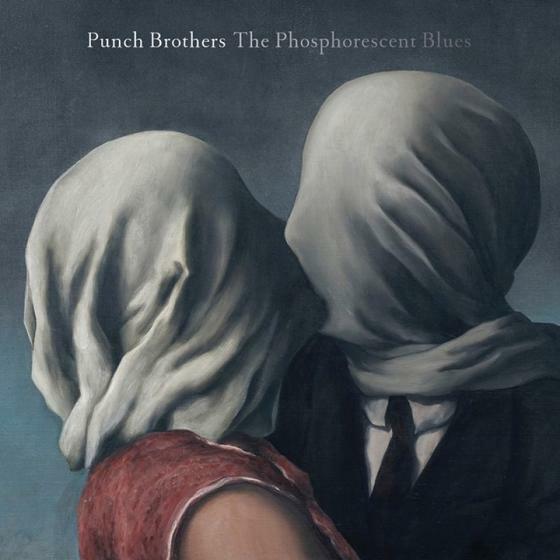 Like every Punch Brothers album, The Phosphorescent Blues is defined by technical chops. But its lyrical focus offers a vibrant edge over its predecessors. Thile’s words are both deeply sad and quietly hopeful, meditating on the way pieces of vibrating plastic drive us both together and apart. “How long, oh Lord, can we keep the whole world spinning under our thumbs?” the band warmly harmonizes on “My Oh My,” their voices rising and falling. The answer’s there—not in their words, but in the way they ask.